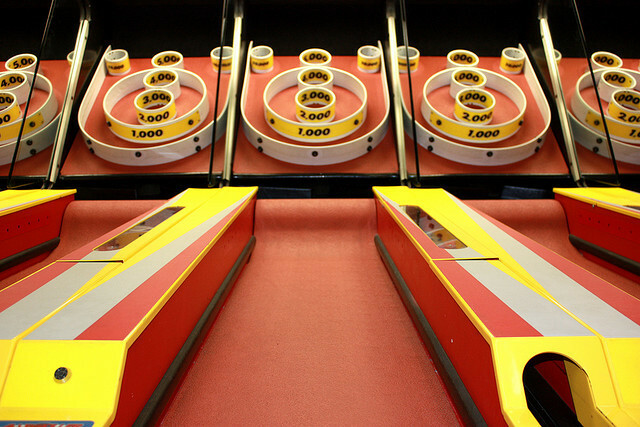 This new version of Skee-Ball is free for a limited time (celebrating its 100th Birthday). This great 3D game has the features like quick flick, roll the ball up the ramp and into one of the numbered holes for points, tickets, and unlockable achievements.When you win so many tickets, you can shop there. You can get the things as your prize like a Peruvian Flute Band CD, vampire teeth, a custom ball to use in-game. More than 80 items are available to choose from. This 66MB addictive popular game doesn’t seem to a 100 old game. Everyday we play it, we love it and never love to stop it. There are three versions of Skee Ball game available for iPhone Users. They are Skee-Ball, Skee-Ball HD and Skee-Ball Free . The normal Skee-Ball game costs you $.99 and the HD Version is $2.99. Whereas all these two version have their free version available to try. The New HD version comes with additional features like : New Lanes, Goodies, Balls and new prizes. You may try your luck with the newly added Sun Ball, Dinosaur Egg Ball, Moo Ball etc. Your scores goes live. Yes, this is a world-wide contest. high scores will be displayed on the web and try your luck to get a seat in that high scoring list. This is a Free light weight iPhone game for Skee-ball lovers and you will love to play it. This 7.1 MB sized Skee Ball 5000 – Boardwalk Bowling Arcade Game by Carter Thomas is compatible with iPhone, iPod touch and iPad. This needs iOS 3.0 or latter to run smoothly. Skee cheats is an app that contains the best cheats for Skee ball players. Secret tips of this app helps you to make an outstanding score on Skee Ball Game. Download this light weight app and get the best guide for making a record score on Skeeball. This is a paid app and you have to pay $0.99. Remember, this is not a game. You have to download the game from the above given link.